The Democratic Progressive Party and the Mutharika family have read with great shock, stories carried in the front pages of the Daily Times of 21 – 27 June 2013 all written by Madalitso Musa and another jointly with Chikondi Juma. 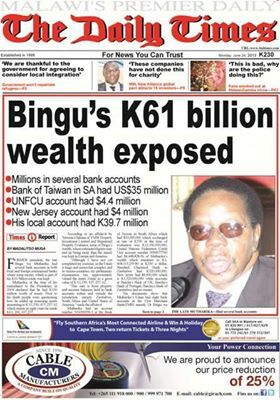 The lead story in the Daily Times edition of 24th June 2013, with the headline, Bingu’s K61m Wealth Exposed claims that the late Bingu wa Mutharika amassed such wealth during his tenure of office. Unfortunately, the paper is quoting an evaluation report purportedly to be of the late President’s estate crafted by Yeremia Chihana, which he has sworn in the High Court as an affidavit. We strongly view this as continued and calculated political attempts by some quarters to harass, discredit and tarnish the good image of the DPP as a party and Mutharika as a family. The issue which is gaining cheap political mileage is in our opinion mere speculation because it has not been challenged and proven as such. It is indeed speculative and unsubstantiated because it is based on an affidavit designed unilaterally by Yeremia Chihana and not facts. To begin with, we question how a reputable media institution such as BNL would deliberately overlook the principles of investigative journalism and base their front page story on an affidavit from the court. A story involving the former Head of State in which huge sums of money are being mentioned should have been handled investigatively and professionally. A credible news paper would in our opinion go an extra mile to source evidence in the form of actual bank statements to be part of the story. BNL has fallen short of this requirement, hence discrediting its report and themselves. Credible journalists will relentlessly pursue and uncover injustices that otherwise would have been hidden from the public eye. BNL could have followed that path before publishing the story. Sadly the story haphazardly published, raises a lot of speculations. We believe the law does not allow arbitrary access to either personal or corporate bank accounts save as provided for under sections 6, 7 and 9 of the Banker’s Books Evidence Act. The Act puts it clear that the court may, if satisfied by evidence on oath, that in fact, or according to reasonable suspicion, the inspection of Banker’s books are necessary or desirable for the purpose of investigation into the commission of an offence, may authorise a Police Officer, duly commissioned as such to investigate the account in question. Clearly, it is only upon proof that there is an alleged offence, and secondly, by virtue of section 6 of the Act, a banker, or any officer of the bank is not permitted to produce any information relating to any proceedings, to which such bank is not a party, unless by an order of a judge, made for a special cause. Our understanding is that such information can only be made available to the court either by the banker him/herself, by virtue of section 6 or by a Police officer, by virtue of section 9 of the Act. In any case, and in both scenarios, the involvement of a valuator, Yeremia Chihana violates the Banker’s Books Evidence Act. 2 Conflict of interest and Independence of the Valuator. The article quotes an affidavit of Yeremiah Chihana, as being the only source of the information. The valuator himself lost his parliamentary seat in 2005, after the DPP led administration successfully prosecuted and convicted him of the offence of unlawful wounding, which bordered on dishonesty and moral turpitude. He went through the two stages of appeal where he lost in both instances, and was further barred by the Electoral Commission, in 2009 from contesting in the 2009 General Elections, upon receiving a letter dated 20th March, 2009, which stipulated that he was ineligible to contest in the elections due to his conviction by a competent court. It should be noted that the valuator, Yeremia Chihana, had only been a Member of Parliament for less than six month, having won it in a bye-election after a vacancy had been created, following the 2004 general elections. 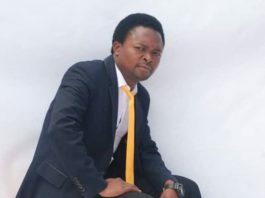 The level of bitterness of Yeremia Chihana towards the late Professor Bingu wa Mutharika and the DPP in general cannot be overemphasised. We also doubt whether procurement procedure in identifying Yeremia Chihana as valuator was followed. Much affidavit evidence if uncontested could be regarded as conclusive on matter of any nature. 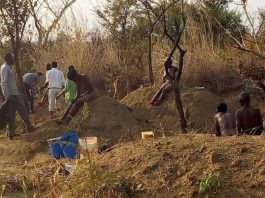 It is to be noted that the report in question, does not indicate whether the administrators of the estate Madalitso, Duwa and Tapiwa Mutharika filed their own affidavit, which the reporter deliberately ignored. This has a prejudicial effect as it exposes the respondents therein to the possibility of an unfair trial, in that public opinion has already been shifted against the estate. Besides, evidence of information obtained outside the jurisdiction, cannot just be taken without being notarised accordingly. Such evidence can only be verified if notarised and not only commissioned. Besides, issues of Private International Law come into play as to what law will have to be applied as regards movable and immovable properties belonging to the deceased that were situated outside the jurisdiction. In terms of taxation, of the said assets, to which authorities is the estate liable to pay taxes? Aren’t we finding ourselves in a scenario where the deceased pays tax to two taxing authorities? At the time of demise of our late President, the Malawi Kwacha was trading at MK 165 to the dollar, while at the time of valuation, the valuer is valuing the dollar at MK 330. This in our opinion does not represent the true taxable value of the assets as it is official that since May 2012, our currency has floated between MK 165/USD and MK 435/USD. This means that the same valuation if conducted at about April, 2012, would yield a different result, as compared to results that would be as at July, 2012, or November 2012, or furthermore, just in April 2013 when the rate was floating. It is really to be noted that the law of succession emphasises on the need to construe the deceased’s will on the basis of what was on the mind of the deceased at the time of writing of his will. Everyone will agree that at the time of the death of the late president, the dollar trading at MK 165/USD, the value that he knew of his property, is not what is on paper today. This can be generally attributed to the poor economic policies of the curent administration. If the assets belonging to the late president have appreciated in value, after his death, it is because the current administration decided to devalue the kwacha and let it float aimlesly. In this respect it can be seen that the jump in the value of the estate of the late president is a result of the acts of a third party, which happens to be the government itself, and it is this government that seeks to benefit mainly as a result of its own act. He who comes to equity must come with clean hands. On another note, it will be noted that the report includes monies belonging to other legal personae as belonging to the late President, which is wrong in principle. For instance, Ndata Farm being a limited company incorporated under the Companies Act, 1984, cannot be the same person as the late president. Section 15(2) of the Act actually clearly states that upon incorporation, the subscribers become a body corporate, which section 21(1) describes as having the capacity of a natural person of full capacity, to carry on business in its own name and right and as such, such a company cannot be held liable for the act of its subscribers and any property acquired by it, belongs to it and not its members or subscribers. The only instance that comes as an exception to this rule, is where the corporate veil is lifted, in the event that that the company is accused of an offence, where the court may order the lifting of the corporate veil, to find individuals behind the company, who should be held liable. As can be noted here, neither is it alleged that the limited company commited an offence, to bring its liability to the late president, nor do we have an order of the court ordering the lifting of the corporate veil and as such attributing the finances of the company to the late present was misconceived. It is therefore wrong for the valuator to represent that money that belongs to Ndata Farms belonged ro the late president. Similarly, Bingu Silvergrey Foundation (a trust), Bineth Enterprise (a limited company), Bineth Education Fund (a trust) and University of Southern Malawi, being a body corporate cannot be held in the same persona as the late president. By virtue of section 3(30) of the Trustees Incorporation, upon the issuance of the certificate of incorporation, the trustees become a body corporate, and have perpetual succession and the power to act, sue and be sued in such corporate name. Obviously, the law does not allow the acts of the members who formed and incorporated the trust to be transferred to the trust, and that is enforced by section 5 of the Act, which emphasises on the issue of personal responsibility of the trustees and its clear here that the property of the trusts cannot be counted as belonging to the late president. In conclusion, the DPP is aware of the continued attempts by some quarters to make it and its leadership unpopular as we draw closer to the 2014 tripartite elections. These attempts only make the party even much stronger, closer together and more focused. As a party which is truly progressive, it will continue to uphold the tenets of democracy upon which it was founded. It is our hope and prayer that the Mutharika family will not continue to suffer mental and physical torment, fourteen months after the loss of their dear and beloved father. 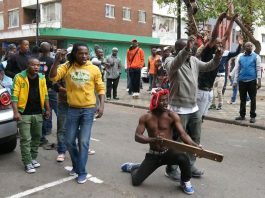 The Daily Times learned reporter, Madalitso Musa has in our view failed to demonstrate quintessence of accepted ethics of journalism that are believed to border on facts. Our considered view is that such reportage is destructive and aimed at causing unrest in our party and the family of late Bingu wa Mutharika. Valuators, such as Yeremia Chihana who is an interested party should not be hired by government to handle tasks of this nature. They will not deliver, other than damaging the image of the government and further leaving the intention questionable. Any sober thinking person will be quick to realise that this is a bloated amount from which Yeremia Chihana himself aims at realising a 10% commission. While late Bingu wa Mutharika is shamelessly being accused based on a mere affidavit, it stands to be seen whether mechanisms are in place to ensure that those pacing the corridors of power today, account for the assets they continue to amass in broad day light. Yapita ijaMCP leader John Tembo has disclosed that he will run for the presidency during the party’s forthcoming convention. 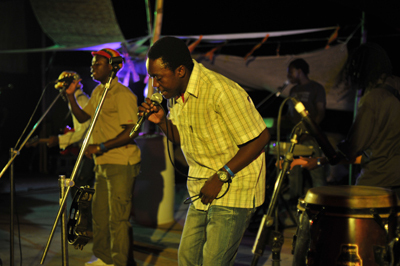 @faceofmalawi kodi zimakhala bwanji kuti news story imodzi mpaka muzichita post katatu?